A couple of weekends ago, my friend Genevra gave me an unusual and welcome gift – a box of tonka beans (an intensely aromatic spice, with strong elements of marzipan and vanilla, with hints of cinnamon and raw tobacco – you can also read about her brave renovation of on old townhouse in Brussels here). I’ve used this spice before to make chestnut jam, but didn’t have any of these beans left, so I’m glad to have them back in the store cupboard as they are not so easy to find. If anyone had ideas what to do with them, then I would love to hear your suggestions. Leave a comment or email to london.eats.blog@gmail.com. In the meantime, I thought I would turn my hand to macarons flavoured with tonka bean. This time, I went all out. I had allowed the egg whites to age (I left them in a bowl in the fridge for a couple of days), and I used the “difficult” method to make the batter (using hot sugar syrup to make a cooked meringue). All this effort seemed to work well, as I ended up with a batch of perfect macaron shells. Smooth, shiny and crack-free!!! All in all, I was very happy with the result. To fill the macarons, I used two different ganaches – one using white chocolate, and one based on dark chocolate. I thought this would be a good way to see whether tonka works better with white chocolate (which would emphasis the tonka flavour) or dark chocolate (where it would be more a care of the tonka complementing the dark chocolate). These macarons were sublime. The flavour was just right – the aroma was in the shells and the filling, and it was sufficiently strong to be noticable but without be overpowering. Over time, the strong almond/vanilla notes mellowed, allowing some of the spicier notes to come out. If you are making these, just be sure to store in the fridge, but allow them to come to room temperature for eating so that the flavour is at its best. And which was better? I can’t choose – the white chocolate has a stronger tonka aroma, but the dark chocolate is as good but tastes quite different. In short, I encourage everyone that has tried them to have one of each. No-one seems to mind. Now…I just have to sit back and wait for someone to send me a tonka bean challenge! Use a nutmeg grater to grind a tonka bean. Sieve the powder finely and discard any larger pieces. Combine the icing sugar, ground almonds and ground tonka in a bowl and sieve well. Set aside. Put 55g of egg whites in a bowl. Whisk very lightly (they should remain liquid). Set aside. Whisk the other 55g of egg whites until it reaches the firm peak stage. Add the remaining liquid egg whites to the almond mixture. Add one-third of the meringue to the almond mixture and combine. Add another third, combine, then add the remainder of the meringue. With a light hand, mix well until you have a smooth, glossy batter. Pipe the batter onto a sheet of greaseproof paper on a baking sheet. Leave to sit in the open for 20-30 minutes, then bake at 150°C for 15 minutes. Half-way through cooking, turn the baking sheet around. Put the chocolate into a bowl. In a saucepan, heat the cream with the tonka bean. Bring to the boil, allow to sit for a moment, then pour over the chocolate. Stir until the chocolate has melted and there are no lumps. Finally, add the butter, and stir until smooth. Allow the mixture to cool, and place into the fridge until set. Use in a piping bag to fill the macarons. Worth trying? Macarons are always popular. The question here is whether they are worth trying with tonka? I think so. 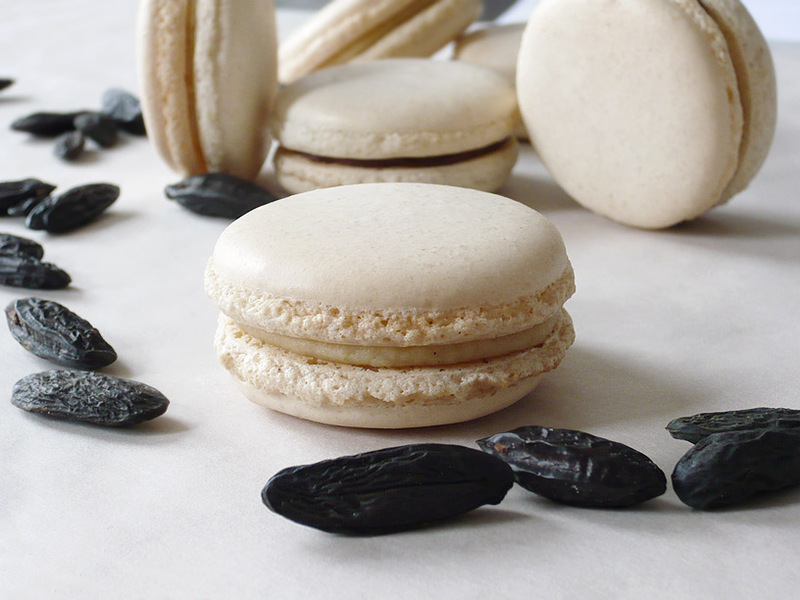 This is an unusual, very aromatic spice and macarons are a great way of showcasing the flavour without it becoming overpowering. Everyone that tried these loved them and commented on the unusual flavour. I would happily give these another go in the future. The information of new ingredient that I have never try before makes me really wanna try know more about it. I have to dig the market for tonka beans now. I’ve just posted macaroon recipe, too today. But it’s simple coconut macaroon.This recipe, on the other hand, sounds great! I love to try it soon. @ Tes – I feel the same way! I love it when people have been travelling or come to visit and bring a new ingredient. It was nice to cook with, as the tonka has some familiar flavours, but no-one knows exactly what it is. These look amazing 🙂 I love the tonka bean flavor. Well done you … macarons are hard to make look as gorgeous as you have here. Quick question. I am converting a few recipes from US measurments (cups) to UK … do you use teaspoons and tablespoons? It seems some UK/AU sites do and some don’t. Also, if you have any tips for converting they will be appreciated!! Thanks so much my foodie friend. Converting recipes can be a real pain, but I use this website. It shows you how to convert liquids from/into cups and millilitres, and also shows cups-to-grams for a lot of common dry ingredients. In theory you should get pretty accurate measures! I’ve used it quite often and it seems to be accurate. But if it does make life easier, we’re happy measuring things out in teaspoons and tablespoons here in the UK 🙂 But then, we are also somewhere between metric and imperial measures, so we’re probably not the best country to ask about this sort of thing! Thank you for sharing this rare macaron flavour. 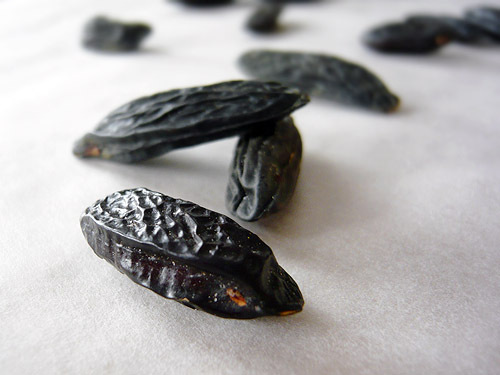 There’s a restaurant we like to go to called The Tonka Bean and I always thought it was a made up thing but your post helped me understand that’s it’s a real food item – a wonderful sounding spice at that! A cross between vanilla and marzipan sounds heavenly.